Wagon Wheel Orchard: We have Pawpaws! When I think of pawpaws, I start singing, "Way down yonder in the pawpaw patch!" And now I think of pawpaw as another fruit we can offer you - fresh and local! We were surprised to discover that our pawpaws have yielded a nice quantity of fruit that should be ready for harvest mid month! What is a pawpaw? It is a genus of eight or nine species of small trees with large leaves and large fruit - a large edible berry with a flavor somewhat similar to both banana and mango and with more protein than most other fruit. It is native to eastern North America and includes the largest edible fruit indigenous to the continent! They are typically understory trees found in deep fertile bottomland and hilly upland habitat. And did you know that the Common Pawpaw is the only larval host of the Zebra Swallowtail Butterfly! 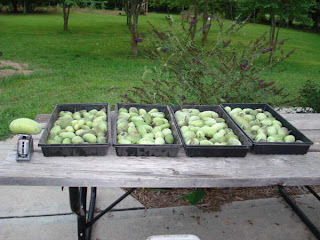 We will be harvesting the pawpaws soon and will sell them out of our Trading Post shop during our open hours. Because the fresh fruit is so rare and very difficult to get, we will be taking pawpaw "reservations"! Simply email WagonWheelMail@aol.com with your name, phone number and quantity of pawpaws desired. They are $3 per pound (approximately 3 fruit per pound). We will fill the reservations in the order in which they are received. If your reservation is unable to be filled, we will call you to let you know! Check out this Granny Smith!